Don’t let the airline dictate your schedule. We all know the guidelines about arriving at the airport *hours* early, but that doesn’t mean you have to obey them. If you feel like running to your gate like a maniac and sweating all over your seatmates, that’s your prerogative. Own it. You’re resilient. You’d recover. So take responsibility for staying an extra hour to wander those ancient ruins, to jam on a project at that coworking space you’ve been working out of, or just to sleep in. The choice, ultimately, is yours. That said, having been your panting, half-dead seat mate more than a few times over, we recommend that you *choose* to arrive early instead. Busy boarding lounges make for hectic work environments, but if you choose the right task for the setting you can smash through more than you might’ve thought possible. Handle the gruntwork and admin stuff on the ground and save the big picture work that requires thought and focus for your time in the air. Being grounded ahead of a flight or on a layover can be a great opportunity to purge some of the neglected admin gunk that’s been bogging you down. The closer you get to your boarding gate, the more intense the atmosphere. Most flyers leave security and make a beeline for their gate. Find yours, then backtrack. Restaurants and cafes are a good spot to set up at off-peak times throughout the day but your best bet for quiet concentration are the in-between spaces that people move through but don’t spend time in. You’ll have less trouble staking out an outlet and getting into the zone, especially if you’re packing some quality headphones a good productivity playlist. Just make sure you set an alarm as soon as you find your spot. Lounges can be excellent places to work and relax. Depending on how long you have before your flight they can be worth paying for a day pass to enter. If you don’t already have access via your mileage status, a credit card or your ticket, do a little research beforehand on which lounge is best. Larger airports will have several lounges, amenities can vary greatly between them, and they aren’t necessarily related to the price of entry. Where one lounge may have nap rooms, massage chairs, showers or even a gym, the next may be nothing more than a slightly less crowded boarding area with free soft drinks. Expect to pay between $20-70 USD for a day pass. Now that you’re in position. There’s always administrative overhead that could use clearing through. Take on spreadsheeting and low-level tasks. Fill out your expense reports, update your CRM, bust out some thank yous or outreach emails. Know yourself and be wary of tackling social media activities if your goal is to be productive at the airport. Inbox zero is the fleeting state of emptiness found at the end of the email rainbow.🌈 In spite of what productivity experts recommend, many of our inboxes function as to-do lists. Use your time in the lobby to dispatch that email overflow, unsubscribe from junk mail you’d forgotten you signed up for and zero out all of your accounts. If you spend a lot of time online, you’ve probably been using a bookmarking or ‘read-it-later’ tool to save articles like one or all of these: Pocket, Instapaper, Evernote, Safari’s built-in Reading List, Feedly, Raindrop (guilty as charged). No doubt you’ve stashed away enough reading material to last through a round trip flight from San Francisco to Singapore and then some. Dive in, sort, and pitch the stuff that’s no longer relevant. If you’ve really got some time, this could be your chance to consolidate down to just one. Then download the ‘must reads’ for the flight to your phone or tablet. Analog planners have been making a comeback. Our brains just seem to relate differently to paper than screens. If you’ve made bullet-journaling or planner-izing a part of your routine, use your time on the ground to catch up. Organize your tasks, jot a few notes on the day or drop some gratitude. You’re at the airport, after all. It’s pretty likely you’re headed someplace awesome. BONUS: analog journals have no batteries to drain. Make sure you have anything you plan to work on in flight downloaded ahead of time. Whether it’s docs, email or articles, make sure you can access what you need offline so you’re ready to have a massively productive work session once you’re in the air. One of the best parts of flying ‘carry-on only’ is that you limit yourself to an amount of gear you can reasonably manage to haul around at your destination. Going for a walk is a great way to boost your creativity and get a bit of exercise before you’re wedged into a seat for the next 15 hours. 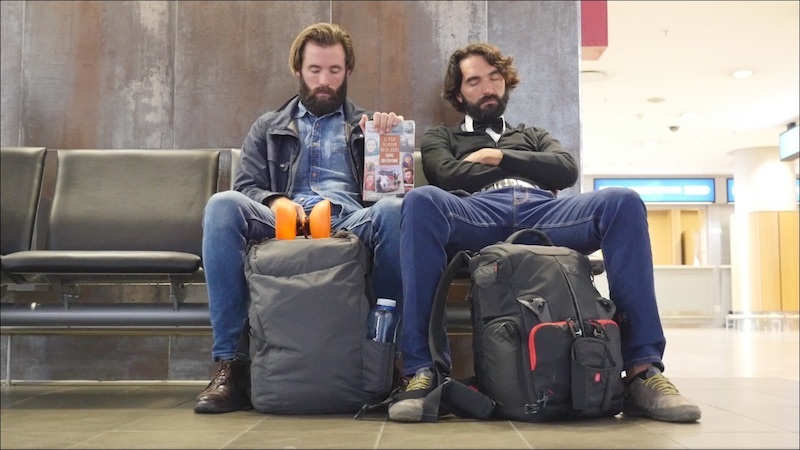 Though we tend to nap on takeoff, you can always catch up on a few Zs or try to clear your mind at the airport. This is where locking zippers come in handy. Whenever you’re sleeping in public just make sure to thread a leg or arm through your bag’s straps. Oh, and if you do take a nap, make doubly sure that you’ve set an alarm so you don’t sleep through your flight. Milan and Muammer of Optimistic Traveler, catching some rest. While access to wifi in terminals is pretty reliable these days, in the air, it’s still a crap shoot. Plan to work offline. Besides, you’re in a tube hurtling through the sky miles above the real world. Take advantage of your airborne isolation tank to do some deep work. With the mundane tasks and admin out of the way, and the jet bridge closed, you should have at least a few hours of distraction-free time ahead of you. Peter Shankman, founder of Help A Reporter Out (HARO) and Shankminds, has booked round trip international flights solely for the purpose of finding a place to focus. Here’s how he turns each flight into his own private writing studio. Peter’s unique, but not entirely alone. Writers from Maya Angelou to J. K. Rowling have been known for renting hotel rooms to use as writing retreats. They’d steal away and focus for long uninterrupted stretches, sometimes for days at a time. You shouldn’t be in the air for that long (Drop your longest flight time in the comments! ), but when you’re planning your trip, think about how much time you’ll have in the air and what might lend itself to some deep, offline focus. Be realistic about what you’ll have time to accomplish at the airport and in the air. Think of everything you can knock out on a travel day as a bonus. Not all tasks lend themselves to working in transit, but if you can wipe out some of the busy work on the ground and tackle one or two deep thinking tasks in the air, you’ll have more bandwidth to focus on the critical must-dos and occasional fires that pop up once you’ve landed back in the real world or at least have access to a decent desk. How do you stay productive while at the airport or on the move? Drop your tips and reactions in the comments.